Details: Packaged Italian dry salami. 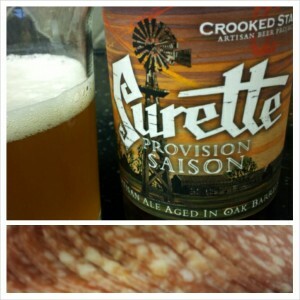 Surette Provision Saison is brewed by Crooked Stave in Denver, Colorado. Crooked Stave specializes in barrel-aged, wild, sour, and funky beers. My palette still isn’t quite used to sour beers though I am trying more and more of them. The Surette Provision Saison was extremely sour, one of the sourest I have tried. It was really just too much for me. The salami was good. Very simple and easy snack. The big question is: how was the beer with the food? The answer is: good. The pairing improved the beer. The fat and greasiness of the salami seemed to take away some of the tangy sour flavor in the beer and helped make the beer drinkable. The sour flavor was still very prominent but it was a little bit easier to drink. A very interesting fact about this pairing is that the salami does not have the same affect on the beer if you add a cracker and cheese. We typically don’t just eat salami by itself, we typically add it to a cracker and cheese but in this case, the cracker and cheese returned the beer to its original sourness. The beer paired better with the salami alone.